CRYSTAL QUEST® Reverse Osmosis 50 gpd (Gallons Per Day) Membrane TFC/TFM Filter Cartridge is a replacement cartridge for RO systems. It removes lead, sodium, cyanide, ammonium (ammonia), mercury, bromide, cadmium, trivalent chromium, radium, magnesium, fluoride, nitrates, nitrites and many other harmful elements from water. * TFC/TFM - Thin-film composite membranes (TFC or TFM) are semipermeable membranes manufactured principally for use in water purification or water desalination systems. Question: Some websites say that it is a bad idea to touch membrane with bare hands. Is this true? Answer: It is true for some membranes, but not for ours. 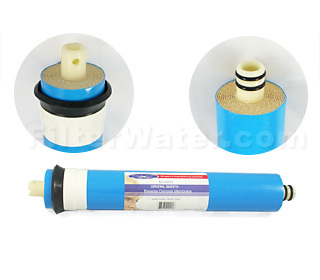 Our membranes come in a blue protective housing, and there is no problem with touching it.